One of the ironies of my blog is the fact that I am the least crafty (&/or artsy) of the bunch when you compare me with my siblings (and siblings-in-law). I wish I could say that I was exaggerating but I wasn't. The picture is called "Hello Down There" and it was painted my by my talented sister, artist and art therapist, Linda Turner. 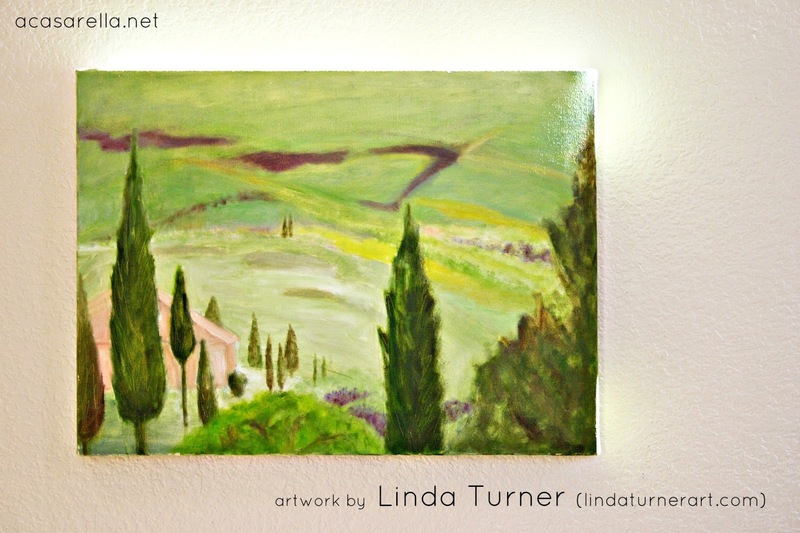 Inspired by a trip to Italy, this image is also reminiscent of my beloved Southern California with its rolling hills and Cypress Trees. I was so excited to receive it this holiday season. My only dilemma is where to put it. I thought I had the perfect spot but then I found two more perfect spots. Wonderful gift! Wonderful artist! Lucky wonderful, you! I love landscapes - I have a collection of vintage ones! Your sis is very talented - quick hang that up! Ha, I know exactly what you mean, my sister is a genius at crafting and cooking, but I'm the blogger (although even there I don't pretend to be that good. You came highly recommended by Amy at While wearing heels, and I have been meaning to check you out since. Looking through your blog, she was right! Beautiful! It's nice to have talented family members! Gorgeous! I totally am lacking in the artistic department, unlike my husband who can draw anything well! Amazing! What a gift - both figuratively and literally! Good to know you have plenty of options for placing it - I'm sure it will be a wonderful conversation starter for guests to admire.